Our hand-made glass products carafe, liqueur glass in Art Nouveau style with blue dancer made of Lauschaer glass are very harmoniously and balanced in shape and color design. 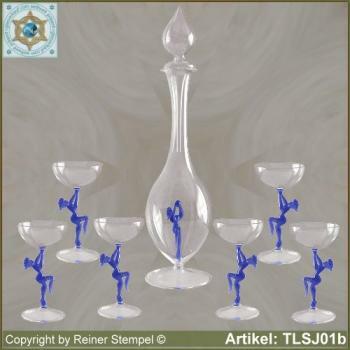 Wherever they are used, (eg, for fine drinks liqueur, brandy, pastries or on festive covered tables, showcases, bars, etc.) are very decorative highlights to the eye of the beholder.